The ferry “LaSalle” which ran between Windsor and Detroit, is this weeks Throwback Thursday Pic. 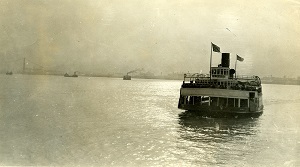 The photograph taken circa 1928, the “LaSalle” was launched in Toledo, Ohio on 29 May 1922 and was put into service that July. The ferry could carry up to 3000 passengers and 75 automobiles. In the back and to the left of the photograph is the half completed Ambassador Bridge which opened in 1929, and would help contribute to the end of ferry service between Windsor and Detroit in 1938. The “LaSalle” would soldier on carrying passengers and vehicles to the bitter end. If you are interested in viewing more historic photographs of Windsor, please visit the digital exhibit “Windsor’s History and Pictures” at http://heritage.windsorpubliclibrary.com/.